Editor’s Note: This post is part of our Build My Business series, in which our in-house experts, hobbyists, and insatiably curious marketers show you how they would use LeadPages to launch a campaign for a very specific—though hypothetical—business purpose. I have a special affinity for people who style hair for a living. After all, people rely on them for self-esteem and confidence daily. It’s hard to fight back a smile when someone tells you how great your hair looks. I also know how hard it is to gain traction for your business. New competition pops up almost weekly. But if every salon and barbershop owner knew how to consistently generate customers for their business, the threatening feeling would transform into empowerment and confidence. In this post, I’m going to give you a simple salon marketing strategy to attract new customers, keep existing customers coming back, and turn happy customers into evangelists for your business. It’s designed for salons and barbershops, but any service-based business could use elements of my strategy. When most new service-based businesses start off, they tend to focus on things like getting a fancy website and a logo designed. I would challenge that approach, however, and present you with one that is much stronger. The very first step when starting your business as a stylist or barber should be to identify how you are going to generate leads for your business. Better yet, you should think about how you can do this with the least amount of work needed on your part. You should think about automation. Keeping that in mind, I created a complete campaign designed to be accessible to anyone in the hair or beauty industry—even if you’re totally new to marketing and don’t want to spend much time on it. Let’s assume I’ve just opened my salon or barbershop. In that case, my main focus is to just get as many people through the doors as possible. To do that, I’ll create a webpage devoted to generating leads—that is, people who are interested in my business and are likely to become customers. The first step will be to offer something appealing to my audience in exchange for their email address. For example, I could give new customers a complimentary hair conditioning treatment on their first visit if they schedule any other service. To offer this freebie, I’ll build a landing page with LeadPages®. The entire focus of this landing page is to get people to say yes to the free add-on service and visit my shop. I could publish this to a simple, easy-to-remember custom URL, such as http://www.myhairbusiness.com/free. Think of this landing page as someone handing out coupons or flyers for your business in the mall or on the street corner. The main difference is, your landing page never gets tired or goes off the clock. So you now have a way to deliver coupons to prospects 24/7. With LeadPages®’ built-in Lead Magnet Delivery system, I don’t even have to go to the trouble of emailing out the coupons myself. 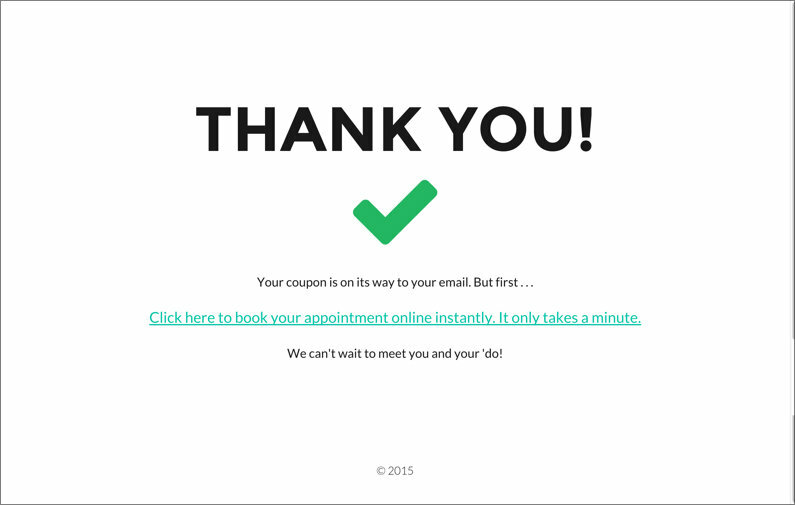 When leads opt in, they’ll automatically be sent a coupon by email. Now it’s time to get some traffic to that landing page. Tech Tip: When I set up my landing page, I’ll need to tell LeadPages® where to send all the email addresses of my new leads. To make sure I can keep them all organized and easily contact them in the future, I’ll sign up for Active Campaign, a beginner-friendly email autoresponder service. We’ll see some of the features that make this a good option for me in later sections. Imagine that you just built your business in the middle of a cornfield. You can sit and hope people find a way to get to your business (like most business owners do), or you can create a path that leads directly to your front door. 1. Social Media: I’ll put the URL to my landing page—not my home page—on all of my social-media profile About tabs. That way, anyone who checks out my posts (things like my salon space or before/after shots of my clients) won’t just learn what my business is about—they’ll be invited to experience it themselves at a great price. 2. Business Cards and Flyers: Why not give the potential clients who encounter me in the real world a chance to get in on my new-customer offer? I’ll make sure to advertise my landing page URL on any print assets I create. 3. Website Banners: Assuming I also have a simple home page, I’ll use a tool like Canva to create a beautiful banner for my website that links to my landing page. I can place variations of this banner directly below my navigation bar, on the sidebar, and maybe in the footer as well. 4. Email Signature: I’ll also add the link to my landing page to my email signature line. You’d be surprised at how many people actually read and click the links in email signatures! Through targeting, I can expose my ad to several hundred carefully chosen people each day. For instance, I could create an audience of only women ages 25–60, living in zip codes near my salon, with moderate incomes (high enough to spend on salon visits but not so high that they wouldn’t be tempted by my coupon), known to purchase hair-care products. And I could create a second distinct audience if I wanted to run ads to my landing page variation for men. For $10 a day, I can reach exactly the customers who are most likely to visit my business. Plus, as of this fall, you can simultaneously run ads on Facebook and Instagram. I’ll definitely enable this option—uploading some real images of my salon and work once I have them—to take advantage of the visual appeal inherent in my field of business. Check out our Facebook Advertising course if you’re interested in getting your first ad up and running quickly and inexpensively. 2. Google Local SEO: So far I’ve spent very little money on my marketing, so I feel comfortable investing a bit in this area. For around $300 a month, I’d hire an SEO agency to help me rank organically on Google for anybody searching for a haircut within a few miles of my business. Since my goal is repeat business, I should only need to use this service at the outset. Now we need to provide a way for our new leads to schedule an appointment. But the last thing I want to do is have them call in. Remember, we want to automate as much of this process as possible! So I’m going to use online scheduling. Once someone submits their email address on my landing page, they’ll be taken to a second page—the thank you page. Usually, this page simply confirms that you have successfully received someone’s email address. 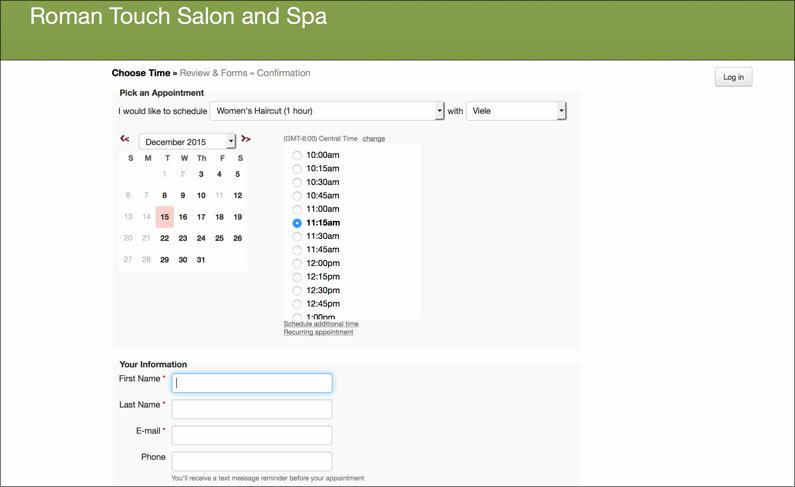 But here, I’m going to add something powerful: a link directing them to an online scheduling calendar. The software I recommend for this process is Acuity Scheduling. It will sync up with your personal and professional calendar and only display the times you have available—no scheduling assistant needed. Since my leads know they’re getting a free bonus, they’ll be likelier to take the next step and book their appointment right away. And once they’ve done that, I can also let my online scheduling software handle the job of reminding them to show up via email or even text message, at intervals of one day and one hour before their appointment. That’s a good start, but it won’t put me where I need to be quite yet. For one thing, I need to make sure my new customers come back for another cut. So I’ll create another landing page—and here I’ll get creative. One of the features I like most about LeadPages® landing pages is that all of the templates look great on all devices. 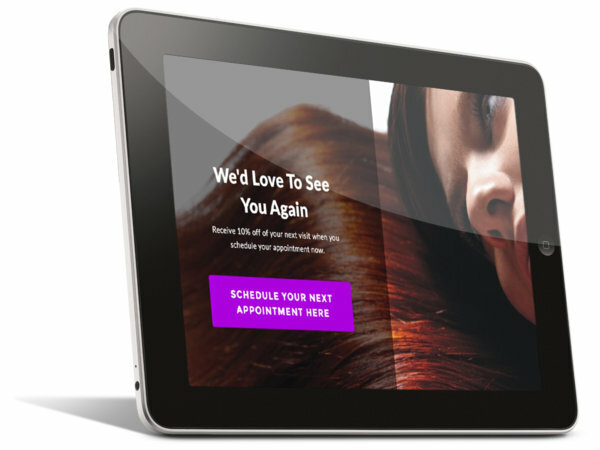 Such as an iPad that sits at the front desk of my salon with a landing page already loaded on the device. Before any customer leaves, I’ll offer them the chance to get a 10% discount off their next haircut if they schedule it before leaving the salon. I’ll simply have them use the iPad to opt in for a new coupon (on a similar landing page advertising this customer-only offer) and use the thank you page to direct them to the scheduler. Tech Tip: ActiveCampaign has the ability to determine if someone has already claimed their 10% coupon. So although someone may schedule multiple times, they will only receive the 10% coupon once. The final step is to turn those satisfied customers into outspoken evangelists for your business. This will be a new and invaluable source of high-quality leads, which will become even more plentiful as more new customers tell their friends. 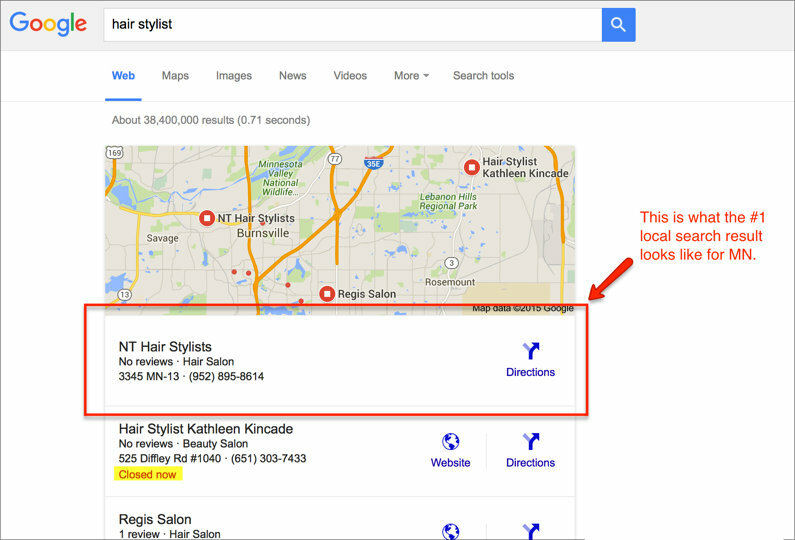 People will naturally spread the word about a service or product they are satisfied with, especially when it’s as easily visible as a haircut. However, you don’t want to solely rely on people’s good will for your business success. Again, I’ll offer an incentive—this time to reward people for sharing my original landing page. I’ll offer a free wash and style or haircut to any customer who gets 5 people to opt in for my original coupon. The cool thing is, I don’t need loyalty cards or any additional software to pull this off. In my email autoresponder sequence, I’ll set up a follow-up email to go out automatically after someone opts in for my first coupon. The email will explain the referral incentive and invite people to share via a special link. http://myhairbusiness.com/?id=ChrisI’ll set up a hidden field in my landing page’s LeadBox™ that will automatically pull in the special URL for that page. 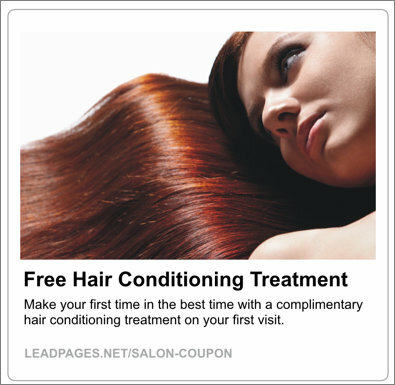 Now when anybody clicks that link and submits their email address to claim the free hair-treatment coupon, the customer-specific URL will be recorded in that person’s contact record inside Active Campaign. I can keep track of how many new customers came from their referral and reward them with the free service once they’ve gotten 5 people to opt in. I can keep all of these tactics running indefinitely until I have all the business I can handle. Once I have regular customers to help build my salon’s reputation, I can shut down my Facebook ad campaigns and taper off my SEO investment to reduce my costs. As time goes on, I’ll also plan to make use of the email list my landing pages are building for me by occasionally reminding my customers to stop back in for their next visit. Have any questions about this campaign, or ideas for other topics you’d like the Build My Business series to cover? Tell me in the comments! By using a clever strategy involving LeadPages® and Groupon, this first-time salon owner went from 0 to hundreds of loyal customers and became profitable in just two months. Here’s how to create a killer personal trainer campaign that relies on free content and smart follow-up tactics to bring in leads who are enthusiastic about your services before you even sell them.